We finally received the Flight Outfitters Lift Bag we had been hearing a lot about. Read on to discover why this is the perfect bag for every type of pilot! Flight Outfitters® was founded by Mark Glassmeyer in 2014. Mark has loved all things aviation since he attended his first Oshkosh air show with his late grandfather, Ed Wickemeyer, and his WWII B-24 bomb group at age seven. 32 years later after college, four children, and all other things life offers, he finally earned his Private Pilot ticket. In 2005, Mark started a functional bag and case manufacturing company located in Cincinnati, Ohio. For years the company has made high end functional bags under private label brands for several industries like law enforcement, fire, EMS and pharmaceutical companies. The more hours he logged, the more he wanted to make flight bags for student and GA pilots. After more than a year of development Flight Outfitters® was born. Now the brand includes flight bags, kneeboards, flashlights and apparel. This sturdy bag has room for all the essentials but won't get in your way. Includes a large headset pocket, iPad pocket and multiple organizer sections with room for all your accessories. A helpful exterior pocket makes it easy to grab your backup radio in an emergency. Steel-reinforced carrying handles will haul even the heaviest load, and the reinforced sides offer additional protection. The signature orange interior makes it easy to find the flashlight or pen in the dark. After hearing so many great things about it, I decided to order one for my own flight training. You know that feeling when you order something online and keep refreshing the online tracking page 1000 times every day? That's how excited I was to receive the Flight Outfitters Lift bag! After a few days, the bag finally arrived in a big sturdy box; well-protected ánd nicely presented. On the back of the bag, there is a similar compartment, with some smaller pockets to organize your gear. These pockets are ideal for cables, batteries, power banks, etc. 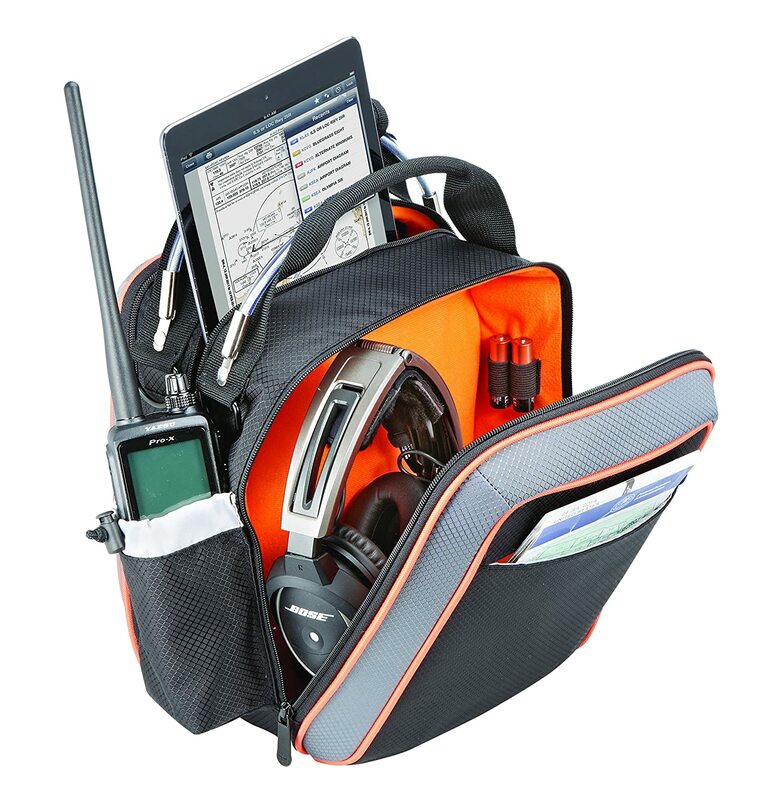 On both sides of the bag, there are also conveniently shaped pockets to hold fuel testers, pens, flashlights and your handheld radio. They are perfect for things you might need quickly in flight, making it easy to reach time without having to open and search through your bag. In the middle of the bag, there's a large compartment that can hold your kneeboard, charts, logbook and other document-shaped items. Only minor downside is that this compartment is just too small for A4-sized documents and binders, but that would also increase the size of the bag, which is perfect as it is. On the front and back side of the bag, there are also two smaller sleeves to stow some smaller items like a stopwatch, pens or other small gear you might want to reach easily while flying. You can clearly see the entire bag was designed in a way to make it easy for you to organize your gear and have the items you need within easy reach at all times! Last but certainly not least; the handle of the Lift bag is definitely one of the sturdiest we have come across. The braided wire reinforced carry handle will protect your bag, no matter how heavy it is. During the research for our Best Flight Bags Guide, we came across hundreds of different flight bags, from small student pilot bags to large trolleys for commercial and airline pilots. Since we were looking for a flight bag ourselves for our PPL flight training, the Flight Outfitters Lift Bag turned out to be the best option. 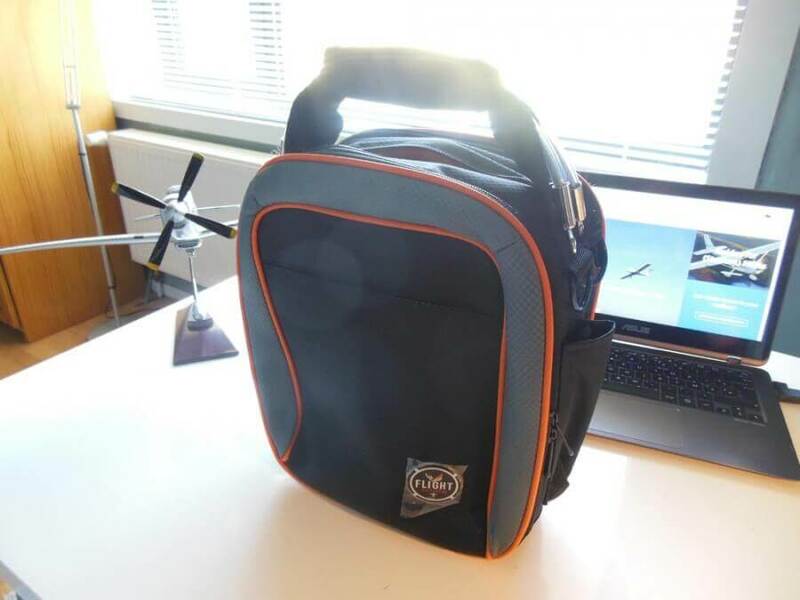 After carrying it on more than 35 training flights, we can assure you this bag is the perfect bag for student and private pilots, making it easier than ever to carry all your flight gear with you, while keeping it organized and protected! This bag was made with convenience and quality in mind. We are convinced this bag will last for many many years of flying! You can read hundreds of more reviews about the Lift Bag on Amazon. With an average rating of 4.7/5 over 56 customer reviews, everyone agrees this is one great flight bag! Read all the reviews here. If you buy the Flight Outfitters Lift Bag through any of the links on this page, you are supporting the Hangar.Flights website and the creation of even more great - and free - content for (student) pilots. We appreciate it!